Dairy farmers, lot feeders, hay makers and those looking for a multi-purpose and versatile tractor should look no further than the Case IH JX tractor and loader with optional 3rd Service and hydro-Ride functions. 3rd Service is a function that allows the operation of hydraulically-controlled loader attachments including 4-in-1 buckets, silage grabs and post hole diggers. Hydro-Ride is a loader control system that reduces wear and tear on tractor components and provides operator comfort, especially in uneven terrain. 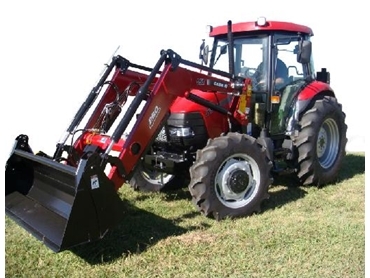 The Hydro-Ride function makes loader operation safe and comfortable while increasing tractor durability. “Hydro-Ride reduces tractor wear and tear by smoothing out the bouncing movement that is typical during loader work, particularly when the loader is full,” Stuart explained. “It is a hydraulically controlled system that is installed on the loader arms and links to the tractors hydraulic system. So while the operator enjoys a more comfortable ride, their equipment is also benefiting as there’s less pressure and stress on the front axle and less wear on the tyres,” he said. Operators can choose from three or four-cylinder JX series models in either two or four-wheel drive. The JX70, JX80 and JX90 models are offered with a choice of air conditioned cabin or open operator platform with ROPS. The JX60 model is available with an air conditioned cabin. All models are water-cooled and feature cross flow engine technology for low fuel consumption.